A Balanced Fighter is a complete fighter, equipped for any situation, whether it is on the street or in the ring. A Balanced fighter must know how to operate on the feet with stand up strikes or throws and on the ground with Gracie Brazilian Jiu-Jitsu. 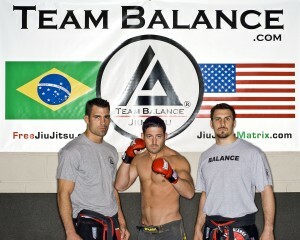 Team Balance has been in the Philly MMA scene for over a decade now. We have assisted many UFC/MMA stars such as: Frankie Edgar, Eddie Alvarez, Charlie Brenneman, Zach Makovsky, Waylon Lowe, Anton Berzin, Timmy Williams and many more. Our approach is very different than most schools. We work with MMA fighters on an individual basis and offer in-house management so fighters focus just on their upcoming fight. This program is for everyone! The goal of this level one program is to safely get you into “fighting shape”, with the fundamentals of MMA and without the danger of full contact sparring. The main goal of this program is to get Professional Fighting Athletes into “Ultimate Fighting Shape” through a rigorous daily routine that includes, Full Contact Mixed Martial Arts Sparring, combat conditioning, Private Instruction, and Management.